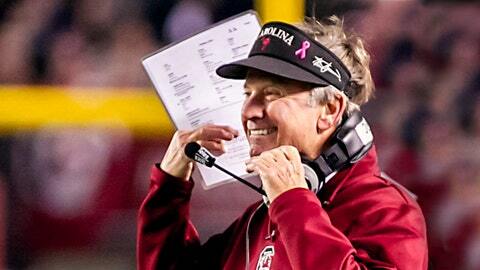 Yo, Coach Spurrier … what are you doing to that exercise ball? South Carolina head coach Steve Spurrier has treated us to several spectacular moments off the field, including his trip to Arby’s and having a beer shirtless at the Daytona 500. But nothing will top a Vine video, apparently captured by one Anthony Sepielli, of Spurrier working out at a DoubleTree hotel before the teamâs game against Florida on November 16. Titled ‘Steve Spurrier working on his thrust game,’ Spurrier is trying to do pushups with the help of a balance ball but really, it looks like he and that ball need to get a room. Any coach who gets made fun of by Spurrier in the future need only reference this video in response. – NFL draft’s top 50 busts: Where are they now?